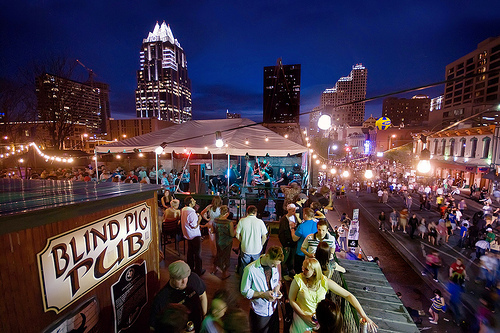 Posted on November 25, 2010 | Comments Off on CLA Sessions Accepted! 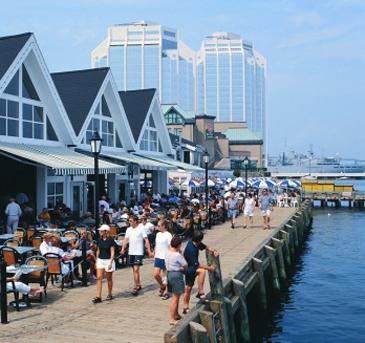 This is Halifax, looking QUITE dapper. Just so ya know I work with the bestest CLA committee eva, and we have TWO count ’em TWOOOO sessions accepted at the CLA Conference in Halifax in May, 2011. Yay, us! Comments Off on CLA Sessions Accepted! CLA is next week! Weeee, I’m excited! Although… before I board my flight to Edmonton on Monday, I have to drive to Ottawa and run a half-marathon. Talk about a kill-joy. Okay, but let’s not talk running, let’s talk CLA! I’m doing a few things while I’m there: I’m participating in two sessions with the Re:Generations Committee that focus on new and aspiring librarians. “Preparing for the Profession” is designed as a little unconference for new professionals, in which we discuss topics that are key to getting into the job market — everything from writing an effective C.V. to negotiating salaries. I’ll be directing the conversation around networking, and creating a professional web presence for yourself, but we’re hoping that much of the discussion is driven by audience participation (fingers crossed!) There are lots of helpful hints on how an unconference actually works from an article on the LNG website (thanks to Megan for the tip). It’s not one of those things where you can sit back and be silent and take notes — But I hope the collaboration and interaction helps create some community among the audience and that we all get to learn a whole bunch. I attended a great session by three marketing and communications librarians from universities across Ontario (Catherine Baird, Marketing Communications and Outreach Librarian, McMaster University Library; Nancy Collins, Communications Librarian, University of Waterloo Library; Cecile Farnum, Communications Librarian, Ryerson University Libraries), who discussed effective marketing and communications strategies, successful undertakings in their libraries and how they pulled them off, and what they focus on in their work. Having sat (rather giddily) through that session, I am now so sold on the notion of marketing in libraries: Effective marketing is also an amazing advocacy tool come budget time, and it makes stakeholders – from users to deans to whoever – so much more aware of the incredible amount of stuff academic libraries do. Having a marketing mentality forces us to think outside of our assumptions about the services and resources we provide, to make the library a truly user-centered space. I mean, if we’re going to sink all this time and effort into marketing services, events and resources, we might as well make sure we’re providing the services, events and resources students actually want. On the topic of assumptions though, I do like some of the assumptions that seem to go without question. Assumptions like, The library is awesome and you want to be here. Or, The library is more than just a support unit for the university; rather it’s part of the core competencies of this place. For example, during the session there was mention of the University of Guelph’s efforts to position the library as the “University Town Square”, firmly place the library at the centre of university life. Or Ryerson University Library’s “Library in your Pocket” tag — befitting for a university that has become synonymous with digital technologies and design, and getting lots of coverage about it’s innovation. One issue that came up is the recent move by Ryerson to designate an area of their library as Silent Study Space. When I was in undergrad I required total and complete silence, which is pretty hard to come by in today’s modern academic library. Today I’m constantly asking students to be quiet or move or get of their phones because fellow students are giving them the evil eye and IMing us on Meebo to ask us to come and tell people to shuuuuush. So I listened intently about how they pulled off this change. Rather than just make the shift to isettlement (which, let’s face it, is a rather unglamorous one that often comes about only after desperate students complain for long enough), Ryerson create a full-throttle campaign to let people know: This change is coming, it’s what students want. And they made these bee-U-tiful posters to get the word out!! 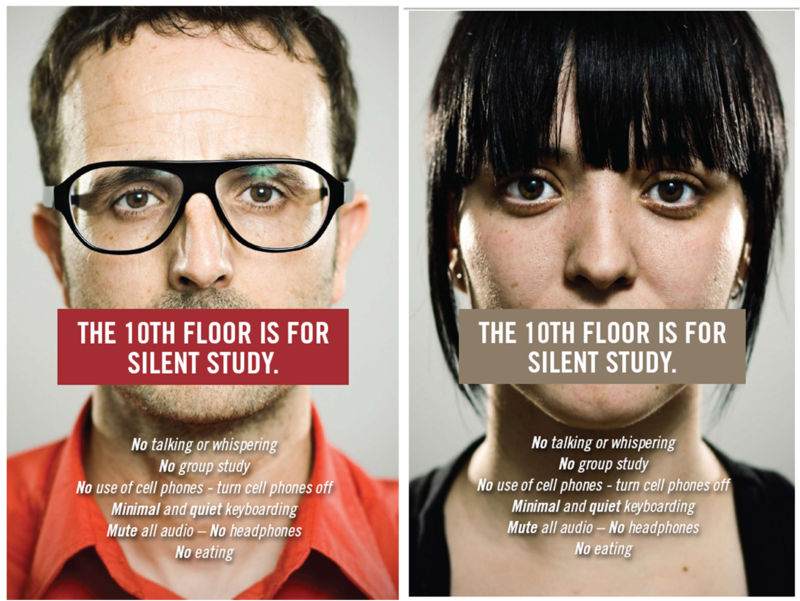 The posters were created by Chris Hernandez, the Graphic Designer person in Ryerson’s University Advancement Office. (Does York have a graphic designer? I want a graphic designer! We always joke about how we make signage that nobody reads. People will READ these gorgeous signs!!). This is the type of improvement library marketing can help deliver more effectively and with less push back from students. I mean if the hipsters say it’s cool to be quiet, it’s cool. Anyway, those are some thoughts on the issue. A few people have commented over at the Re:Gen blog, but any insights are also welcome here! And bravo to Cecile, Catherine and Nancy for a job very well done at OLA. I’ve been trying for oh, the last TWO WEEKS to write a post about all the fun and glorious things I did at the OLA Superconference 2010, but I have some writer’s block or something. So instead, I’ll discuss all the fun and glorious things I presented on, at the conference”s poster session. 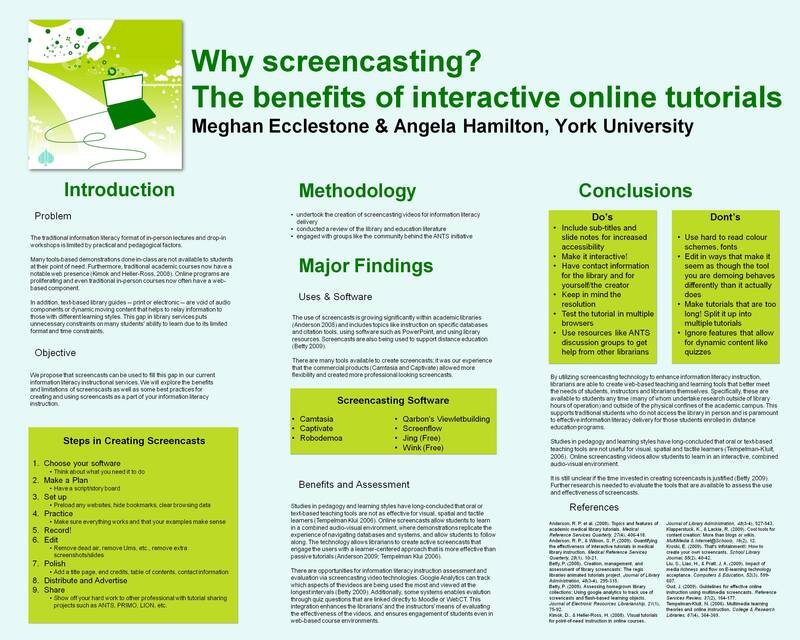 Me and my buddy Angela Hamilton (Science Librarian at York), presented our lovely poster on the topic, “Why screencasting? The benefits of interactive online tutorials”. I say it’s lovely because Angela designed it and she made it look far, far prettier than anything I’d have been able to churn out. Bravo to her. The poster focused on our combined work creating Adobe Captivate videos, with a lit-review we did of existing articles on the topic of screencasting video use in librarians. In fact, there is a lot of interesting coverage of this topic and it informed not only the contents of our poster, but the way I approach my own video-making. We wanted it to be interactive, so we had a laptop set up with Captivate installed, to show attendees just how easy the whole thing is. It was fun to demonstrate in about one minute how you can capture your activities on screen, and turn it into a published video. We also had another laptop set up with our finished videos running on it — videos like “How to use CINAHL” or “How to cite properly”. That was cool too, because it shows off the bell’s and whistle’s of the software, and makes us look like competent, tech-savvy lie-berrians. Which we are, of course. If you are going to be participating in a poster session: Bring lots and lots and lots of handouts. Why do people love the handouts so much? They were like, stealing them right off the table. We ran out. Lesson learned: More handouts. We had about 40 and that wasn’t enough.